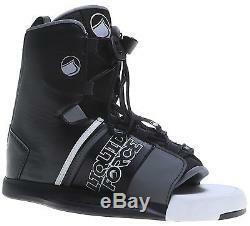 Ronix Bandwagon ATR Wakeboard Standard Mens + Liquid Force Bindings Sz 8-12. 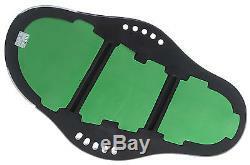 The bindings in this package are available in one size, 8-12. The recommended weight range for a Standard wakeboard is 180-220lbs. The binding sizes are based on availability of the bindings. If you have ANY questions we'll respond quickly bringing you 15+ years of riding and instructing experience. Board - Classic, smooth, progressive freeride arced turns, combined with the stability of a big board, and the swing weight of a small one - the shape that started the camber revolution. At first the Bandwagon project started out to answer - how wide is too wide? Boards have been roughly the same width for years. Then what happens if you crank the arc up on the tip and tail reducing the amount of contact with the water. The Bandwagon is the first of its kind where it has nearly 1% more surface area than most other boards, but has nearly 1% less water contact compared to most. 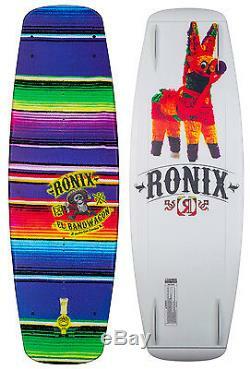 The result is a big board, with Ronix's largest sweet spot and added stability, but because so much of the board isnt touching the water it rides small with minimalist swing weight. Then their engineers threw in something they have been experimenting with over the past couple of seasons camber. Instantly, Erik Ruck noticed how much more neutrally balanced he had become, anatomically correct, driving off the wake using his front foot as much as he would his back foot. Ronix's team was freaking out over how much more of a solid drive and added hangtime they were getting while boosting in so much more of a centrally stable position, and feeling the reduced swing weight of a much smaller board. Ride a wakeboard for the first time all over again - with a freeride twist. Full center rail creates a smooth transferring board from edge to edge. Thin tip/tail profile generates more flex and feel on water or rails. Most exaggerated bottom bevel starts out at 4° blending to 18° on the ends - super forgiving and less likely to get hung up on rails. Deep symmetrical channels - help with acceleration thru a turn and push the rider into the wake. Camber Arc ride a wakeboard for the first time all over again. Running Length makes a big board feel small. A collection inspired by the curves of convexity. 4 Alloy 1.0 Fins & 4 Fiberglass. Ridden by Erik Ruck and Massi. Binding - Key Features of the Liquid Force Element Wakeboard Bindings. N66 Chassis: Injection molded Nylon 6 plastic, 6 inch spread with 12% glass reinforcement chassis that is base in which the binding upper is built. A solid platform that is close to the board, offers response and no heel lift. Anatomical Foot-bed with 2.5 Degrees Cant: Our anatomical foot-bed with 2.5 degrees canting will offer the user a new feel when they ride. We take customer service very seriously. Our priority is to offer the best shopping experience possible. All emails are replied to in less than 24 hrs. 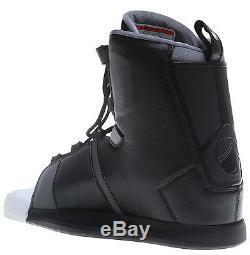 The item "Ronix Bandwagon ATR Wakeboard Standard Mens + Liquid Force Bindings Sz 8-12" is in sale since Wednesday, April 26, 2017.